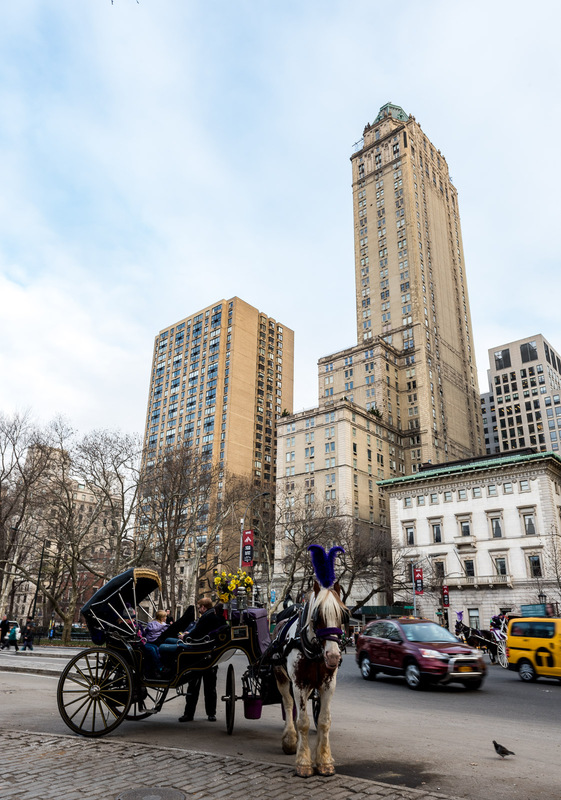 The Pierre Hotel, now part of the India-based luxury hotel group Taj, sits on what is arguably the most photographed and filmed slice of New York City– the south east corner of Central Park. Within steps of Central Park Zoo, the Wollman Skating Rink, the Plaza Hotel and a slew of here now, possibly gone tomorrow horse-drawn carriages, the Pierre is the epitome of “Romantic New York” – quiet, lavish without being showy, and eminently elegant – all with that rare commodity: a friendly, anticipatory human touch. 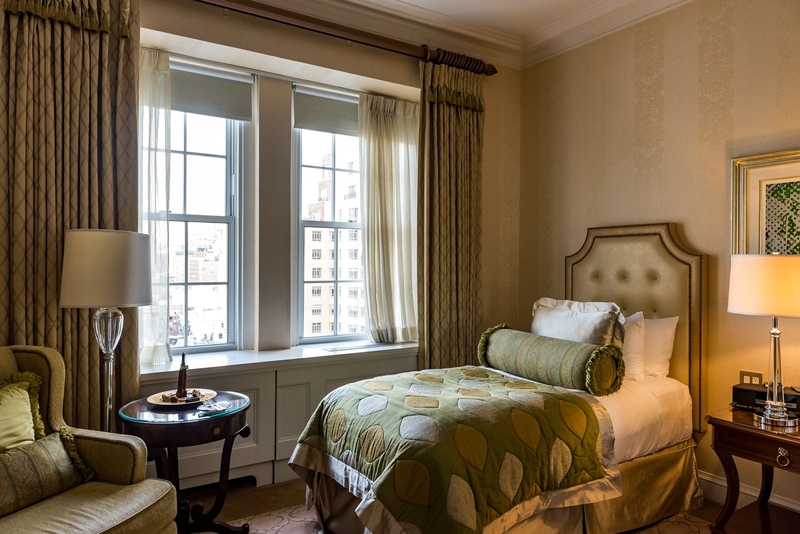 Built in the midst of America’s Great Depression – in 1930 – and then undergoing a $100 million renovation during the financial collapse of 2008 – the Taj Pierre nevertheless emerged from both economic calamities stronger than ever, and ever graceful. Smaller and more refined than the older and larger Plaza Hotel around the corner, The Taj Pierre is often overlooked but shouldn’t be: it’s a Classic in the best sense of the word. There is no grand lobby. The marble floored check-in area is simply decorated with fine paintings and lovely flower arrangements warmed greatly by reception staff who are friendly, proficient and answer nearly every request with a smile and an “of course.” (I had asked to store bags before check-in time). 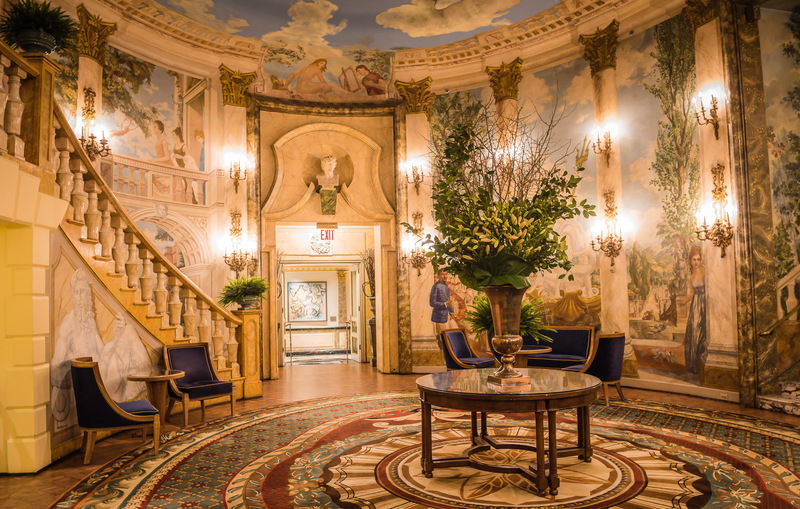 One room – the Rotunda- stands out on the main floor as the polar opposite of the more staid lobby and guestrooms. Every inch of wall, floor, double staircase and rounded ceiling is adorned with a continuous mural. Created in 1967 by artist Edward Melcarth, the gestalt evokes a Renaissance painting, with mythological figures and fanciful scenes. Melcarth used friends as models, so look for resemblances of Jackie Kennedy Onassis and a young Eric Estrada within the artwork. 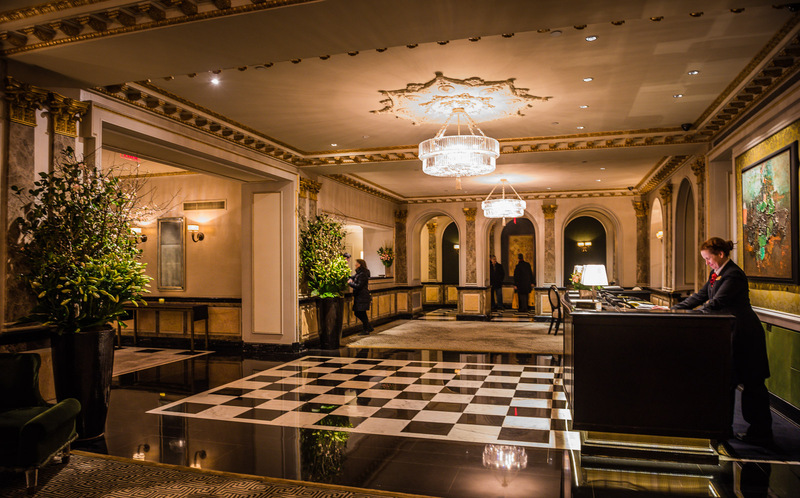 Naturally for a first-class hotel, The Pierre/Taj concierge is exacting and on the ball scoring seats at tough-ticket Broadway shows (sometimes), tough-table restaurants (do-able) and arranging private transportation anywhere. But service goes beyond that here. 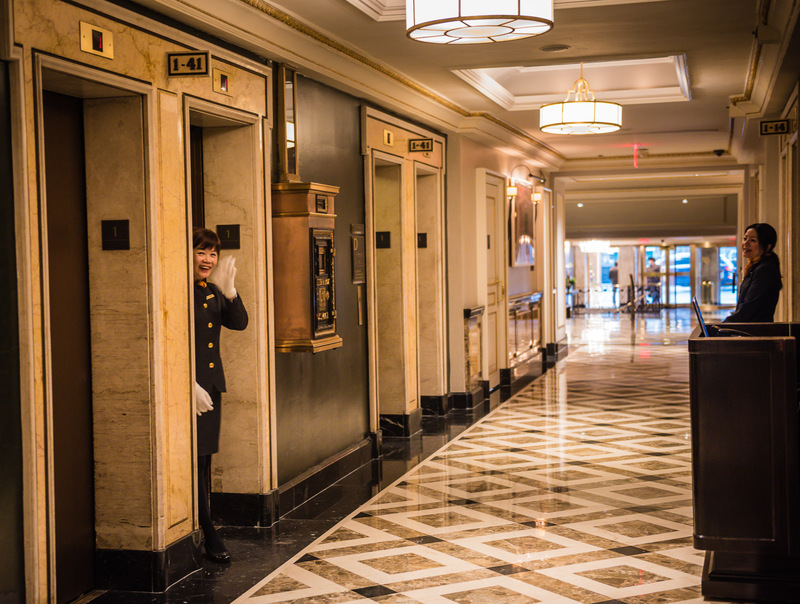 While the first human touch is a genuine welcoming smile at check-in, the second is via an elevator operator who accompanies each guest to his or her floor, points out the direction of the room with a white-gloved hand and, one assumes, makes sure the guest is ok – walking steadily, not confused, etc. It’s common to feel anonymous in a big city– but these discreet few seconds of personal contact makes one feel less so. In the morning, wake up calls are made by a human person who acknowledges your name in a voice smooth as silk and announces the day’s weather. Fifteen minutes later, a follow up call makes sure you haven’t gone back to sleep – like Mom without the griping. Immaculate guestrooms done up in crèmes and light greens are so retro-20’s elegant, you half expect Carol Lombard and Clark Gable to saunter in brandishing cigarette holders and martinis. Bedding, on either a King bed or two twins (typical for older New York City hotels) is deep and dreamy, and miraculously, there are ample outlets on the wall above the bed’s side-tables so you don’t have to crawl on the floor or push aside heavy drapery to find a place to charge your laptop. And double-miracle, The Pierre doesn’t charge for basic wi-fi in the rooms. 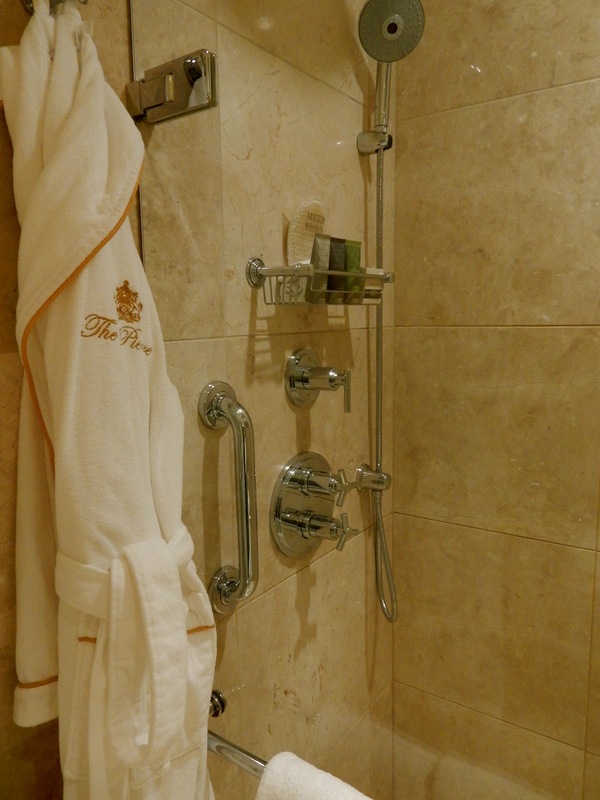 Marble bathrooms feature Villeroy & Boch sinks, Molton Brown amenities, and larger-than-most rain showers. 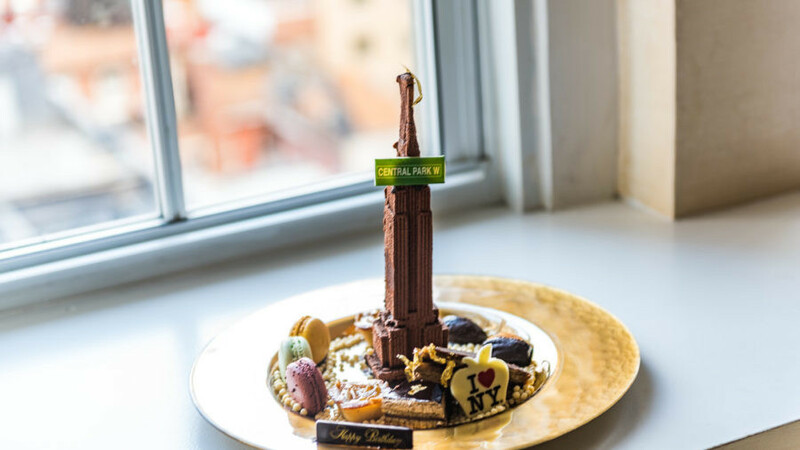 Ask for a “City View” room for a wonderful Manhattan tableau right outside your window. Part of the Maccioni Group, which also owns the iconic Le Cirque, the in-house restaurant Sirio serves classic Italian dishes in the evening and beautifully presented breakfast offerings in the morning. 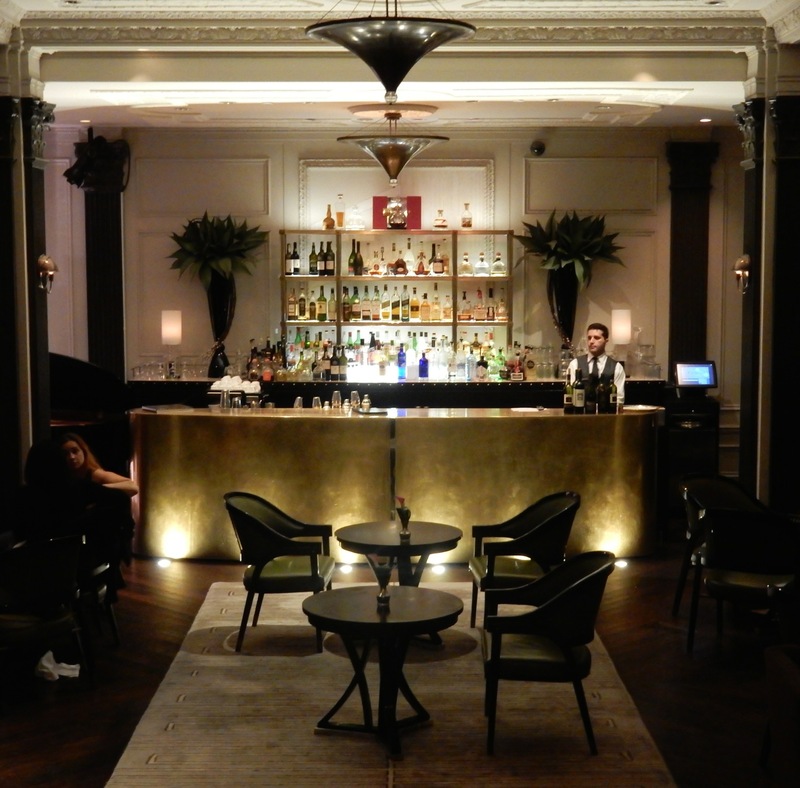 If you prefer small bites to a satisfying but long dining experience, take a seat at Pierre’s Two E Bar/Lounge for bar snacks, sandwiches, phenomenal cocktails and easy-listening jazz on select nights. 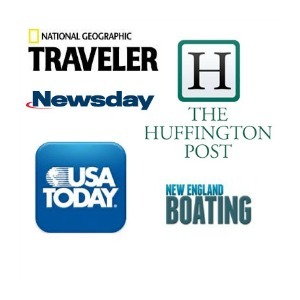 Room rates start at $340 offseason (does not include 14.75% hotel tax). City View Twin on the weekend of Feb 5th is $380 plus tax and includes free basic wi-fi, singular location and unsurpassed service.